Bogle Vineyards is one of those wineries whose bottles you can find just about everywhere. Grocery stores, restaurants, wine cellars. I'm not saying that's a bad thing, it's just the way it is. It's a winery that sells, well, a lot of wine. Fair enough. So this one is the 2010 Bogle Merlot. The label doesn't really give much detail, but fortunately their website has a good deal of information. This wine is comprised of grapes from Clarksburg, Lodi and Monterey, California. All of it was aged for 12 months in American oak. Between the location and the aging style, it's pretty easy to get an idea of what this wine will probably taste like. 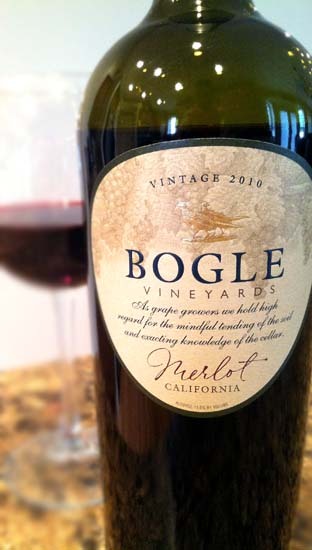 The 2010 Bogle Merlot pours a dark ruby color and has pleasant aromas of currants and cranberries. Tasting brings about semi-dry cherries, plums, more red berries, and hints of earth and that characteristic American oak. The tannins are moderately drying and there's a good bit of acidity, both of which are nice to see. Actually, this wine was better than I was expecting, especially for a mass-marketed wine that's sold everywhere. It's a good, basic, yet solid Merlot. Retailing for only around $8 a bottle, this is a good Merlot for the price. There's nothing not to like here, especially since many similarly-priced bottles are not as tasty. Is it my favorite Merlot for under $10? No... but it's a solid choice. Drink This: if you want a solid, tasty Merlot for under $10. Don't Drink This: if you are willing to shell out a couple extra dollars, in which case you can pick up a Merlot with a bit more depth.